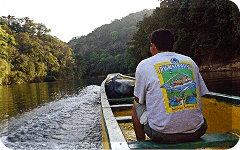 You'll start off with a exciting heli ride to the hearth of Chagres National Park. You'll visit a virtually unseen portion of the jungle, due to the lack of accessible roads, protection against settlers, and the previous non-existence of Adventures Panama. This part of the river, characterized by currents alternating with still waters, is considered Class II, although several rapids are considered Class III by the International Classification of River Navigation. As a result of dense tropical forests covering the basin of the river, sedimentation is minimal; therefore, clear waters can often be expected. Local flora is typical of a tropical rain forest environment, with more than three hundred species per hectare. Although it is the natural habitat of big mammals, such as tapir and jaguar, they are seldom encountered. You can expect to see other exciting samples of fauna, such as rainforest monkeys (including: spider, howler, white faced capuchin, and Geoffroy's Tamarin), sloth, river otter, iguana, toucan, and plenty of fish. The Panama Chagres River Map this section extend from Rio Piedras to the Embera Village. 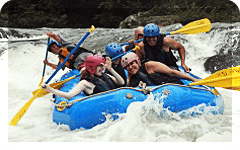 This Chagres Challenge Panama white water river rafting heli ride version begins by picking up guests in Panama City at 10:30 A.M., to take them to chosen heliport. (final times would be given on previous day). Usually we meet a regular trip at Chagres River put-in, at the confluence of Piedras River with Chagres River, where we will land. At approximately 12:00 M., we will start an exciting five-hour rafting tour in the Chagres virgin jungle, all the way to Madden Lake, reaching it around 4:30 P.M. We will have a fine meal somewhere along Chagres River. We will raft by several rainforest tribes conformed by the Embera. Close to Madden Lake, we will board an outboard motorboat indigenous wooden canoe, for about half an hour, to the nearest road. Finally, our guests will be taken back to the original pick up site around 7:00 P.M. Be ready to get some memorable rainforest pictures ! WHAT DOES IT INCLUDE ? All mentioned transportation, rafts and gear, guides, and meals. Our guides are trained in white-water navigation skills, first-aid and CPR. WHAT SHOULD YOU TAKE ALONG ? Swimsuit or a pair of short for navigating, sneakers or strapped sandals, a cap, sun-block, a light jacket or windbreaker (in case the weather turns chilly), a towel and dry set of clothes for the trip back. WHAT SHOULD NOT BE BROUGHT ? Any object than can be deteriorated by water or valuables like jewels, cash, credit cards, etc. Do not bring flip flops or beach sandal to hike or raft. The Chagres River has enough water to do white water rafting in Panama year-round. It usually reaches its highest water level by November, at the peak end of the rainy season, and its lowest water level by May at the end of the dry season. For those persons that are interested in enjoying the fullness of Chagres National Park to enhance chances of encountering tropical rainforest animals such as monkeys of the rainforest, sharing with local Embera indians and campesinos, overnight trips are also available.